The latest issue of Poetry NZ, New Zealand’s foremost poetry magazine, arrived in my mailbox this week. It’s available from most independent bookshops in New Zealand such as Unity Books in Wellington. Issue 43 is another smorgasbord of the best of local poetry writing along with some overseas poets from the US, South Africa, Canada, Australia and Italy. It’s guest edited by Nicholas Reid. 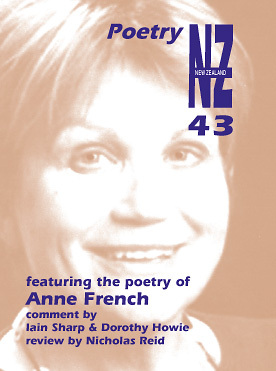 Of particular interest to readers of this blog is a poem by the featured New Zealand poet Anne French that is an elegy for her Aunt using cricket metaphors. French is also a contributor to A Tingling Catch, but I haven’t seen the poem before, so it’s possible it’s a new cricket inspired poem. It’s a moving poem. Many readers with older relatives passing away can relate to it. after a long innings at the crease. on through the blue summer afternoon.